Ruislip St Martin’s Lodge, No 9125 is a stalwart supporter of research initiatives at Brunel University, with whom it is linked as part of the Middlesex Provincial Universities Scheme. The Lodge made a £500 donation to student Jana Deeble, a Ugandan student whose aim was to produce a wheelchair capable of covering rough terrain in remote parts of the African countryside and in other parts of the Third World. The money provided by the Lodge allowed Jana to make a research trip where he could try various design to see which worked. 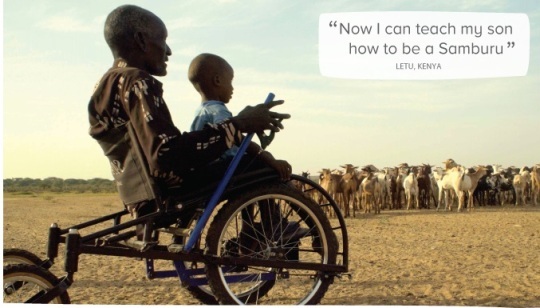 Incredibly, through Kickstarter, a global fund raising initiative which aims to bring such projects to life, the design of the so called Safariseat has changed the lives of many people in Africa. Through the early support of this project by Middlesex Masons, it has gone from strength to strength and additional funding has raised in excess of £90K. Such innovation is to be applauded and it is certain that this is life changing for those for whom it is designed.